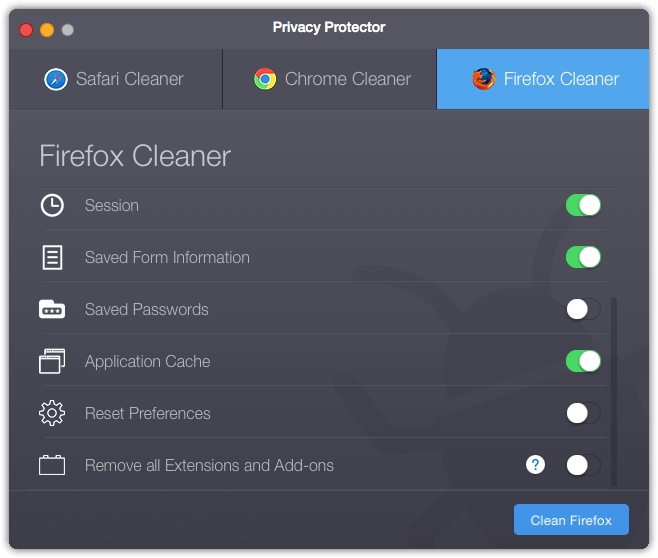 Privacy Protector is exclusively designed for your Mac. 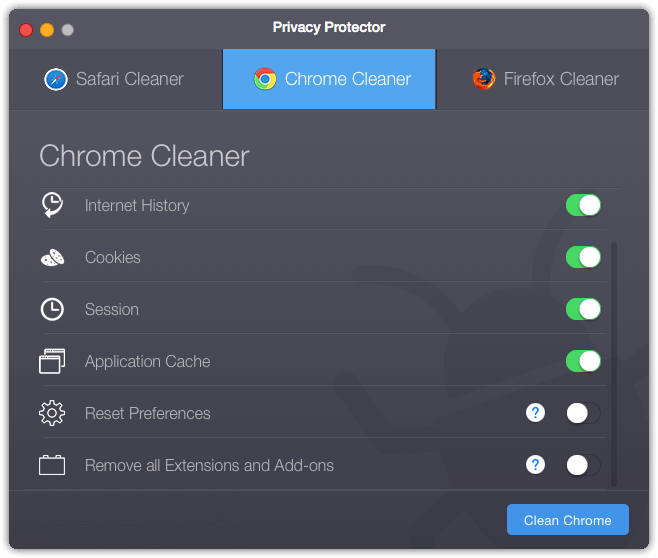 Clean your browsers & protect your privacy for a better & safer Internet experience. Securely clean all the files that may invade your privacy and act as potential threats to your Mac. Privacy Protector is designed to give you the best of internet experience. It includes highest industry encryption standards to ensure that data removal is thorough, yet safe and secure which cleans your browsers and make the faster. 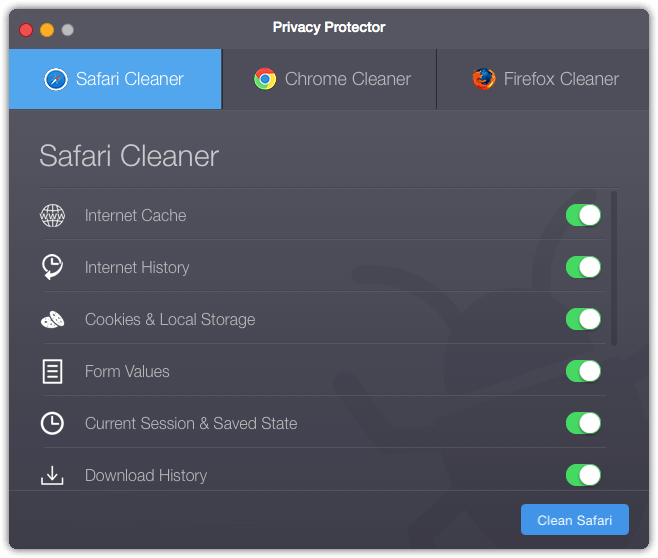 Privacy Protector is an effective way to securely clean files that may invade your privacy and act as potential threats to your Mac. It clean all the privacy threads and sensitive data from your browser to protect your privacy & personal information from the risk of identity theft. 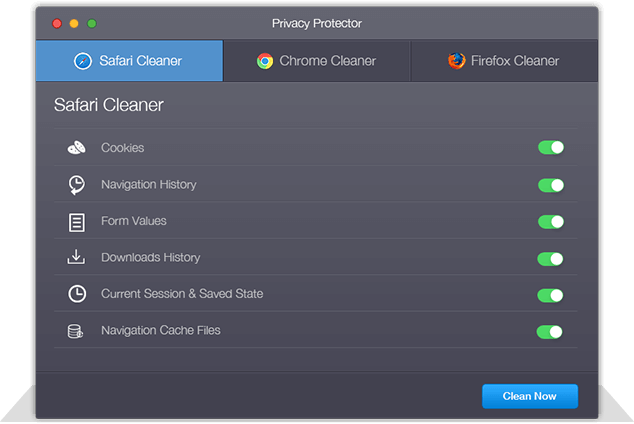 Privacy Protector is a powerful and secure way to clean all the searches, cookies, history and lot more. It also cleans all the add-ons and extensions from the browsers to keep safe from any risk of being hijacked. Includes highest industry encryption standards to ensure a thorough yet safe & secure data removal. Remove Cache files , logs & other unnecessary data, save disk space and make your Mac run. Clear all the sensitive data including history and cookies from your browser. Clean all the navigation hitory, cookies, add-ons, searches, downloads or other sensitive information and privacy threads. The best ever app. I just love it. This app saved me from a lot of problems and made my browsers super fast again. My browsers had a lot of issues and had become really slow, but everything is fine now ever since i got this app. Recommended to all the Mac users. I was always worried about risk of the theft of my personal data and my browsers had a lot of issues. I was so troubled and couldn't find any solution to this problem until i got Privacy Protector, it is just amazing and helped me with all the issues i had. Thank you...!